Tony Trov, left, and Johnny Zito. Together, they operate South Fellini, an online apparel and accessories store with Philly-themed designs. 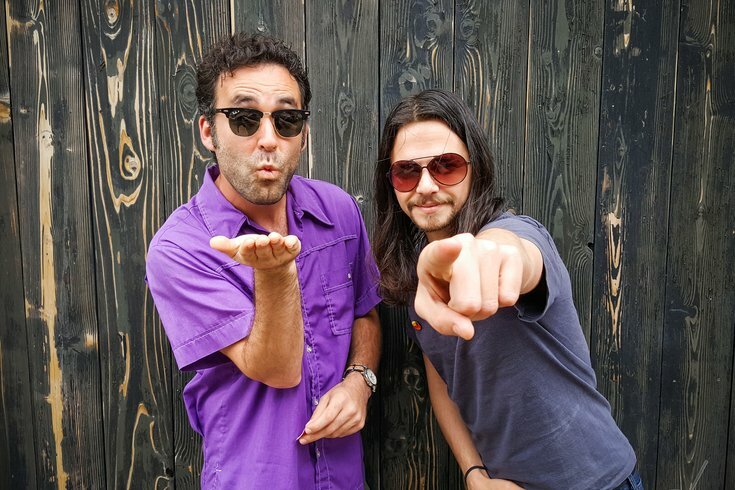 When Tony Trov and Johnny Zito first met on East Passyunk Avenue in 1998, kicking back with a ragtag group of other "artsy" South Philly teens, it wasn't long before they bonded over a particular shared interest: storytelling. “The four or five of us would get together and tell stories about things that really happened, and [Tony and I] would be like, ‘That was a good story, but it didn’t have an ending,'" Zito, 33, told PhillyVoice. "We'd say, 'It would have been better if, funnier if.’"
Together, they set out to cap stories with the endings they deserved. In the decades since, Trov and Zito have become practically inseparable as both best pals and multimedia artmakers. They attended Temple University together in the early 2000s for filmmaking and mass media, paired to create comic book series "Black Cherry Bombshells" and "La Morte Sisters" for DC Comics from 2008 to 2011 and eventually launched their production company, South Fellini (a twist on Federico Fellini and South Philly), to release their inaugural film in 2013. At their core, they emphasize, they're filmmakers. Yet, they're likely better recognized for what they admit was meant to be a means to pay for their horror flicks: The Philly-themed apparel designs that, they might argue, better tell the city's story. The business started with campy sports designs after the Phillies won the World Series, and culminated in the release of the "Queen of Jeans" design — the twist on the "King of Jeans" logo made by street artist Kid Hazo that gave the Philly webosphere a collective giggle last year. Through their online store, you'll find similar tongue-in-cheek twists, like a Wawa logo ("Wawa Jawn"), a North Philly print juxtaposed with a popular ’80s shore design and a skull and crossbones with a pretzel as the skull. A collection of South Fellini pins. 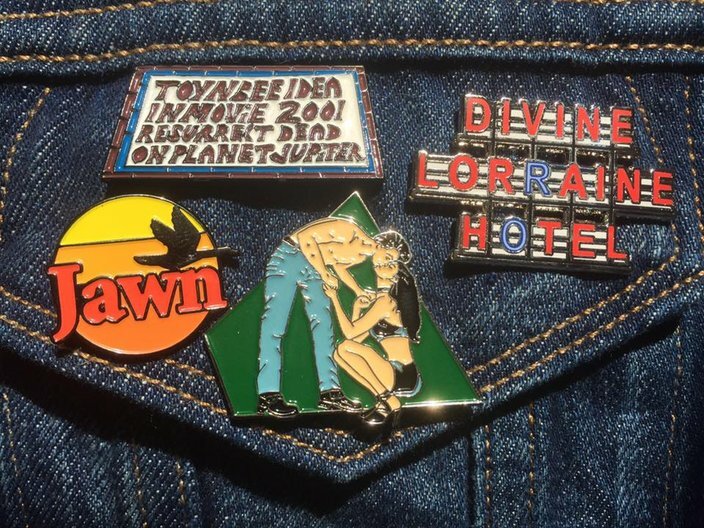 Trov and Zito use both their own designs and non-ironic, faithful reproductions of symbols like the Divine Lorraine and the King of Jeans. The quirky designs, Trov, 32, told PhillyVoice, were born out of the observation that Philadelphia lacks symbols that tell the story of its neighborhoods. “When you go to New York, you can go and buy a shirt that just says ‘Brooklyn.’ But in Philly, it has to say ‘Philadelphia Eagles.’ And if it doesn’t say ‘Eagles’ on it, people are like ‘Whatever,'" Trov told PhillyVoice. "So, we started making Philly shirts that were not just sports-related — doing Divine Lorraine shirts, Tasty Jawn shirts." And it's paid off, earning them enough cash flow to fund their first film and part of their upcoming horror flick, "American Exorcism." They've also been able to expand their online store offerings to patches and pins, which have recently made the rounds on Reddit. Soon, they'll take their wares to their own storefront for the first time — for certain in South Philly, they said, and likely on East Passyunk. Trov noted it's all in the name of filmmaking, but laughed that the T-shirt designs have become an oddly enjoyable side-gig. “We recreate the things we’re capitalizing on lovingly, with the hope we’re putting them out there for the people who can’t get them otherwise," Zito added. They hope to open their shop by the end of summer, as well as purchase a printer to up their production efforts. After that, it's the release of their 2015 film "American Exorcist," a horror movie about a paranormal investigator trapped on the 11th floor of a haunted skyscraper on Christmas Eve, desperately trying to escape. It stars Bill Moseley ("The Texas Chainsaw Massacre 2") and features a humorous cameo by John Bolaris, who plays a caricature of conservative news pundit Bill O'Reilly. Trov described it as a "genuinely scary" but "very stylized" film that's more "Beetlejuice" than "Saw." That film, distributed through DVD and video on demand platforms by Gravitas, is in post-production and has yet to receive a release date. Trov and Zito's end-goal, meanwhile? To become Philadelphia symbols themselves. "We look to inspire Philadelphia culture," Trov said. "And be cult figures in the community way past when we're dead."